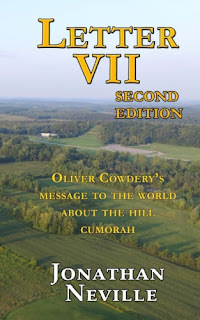 Oliver wrote the eight historical letters, including Letter VII, partly in response to the book Mormonism Unvailed that was published in Painesville, Ohio, in October 1834. In that book, on p. 38, the author writes, "The divine authenticity of the Book of Mormon is the question now before us." When viewed in this context, we can better understand why Oliver Cowdery wrote about Cumorah the way he did. He said it was a fact that the final battles took place there. He said Mormon's depository was in the same hill. He explained that "thousands" of Jaredites died there, and "tens of thousands" of Nephites and Lamanites. In short, Oliver wrote Letter VII to establish facts that contradict the messages of anti-Mormons as early as 1844. In our day, we also need to be familiar with Letter VII and the other historical letters for basically the same reasons.